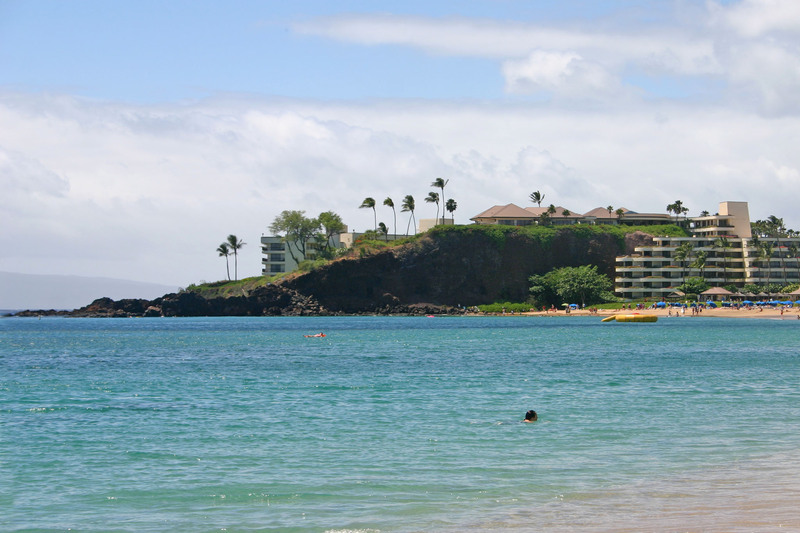 In a nutshell: Black Rock is at the north end of Ka’anapali Beach, and is a great place to cliff-jump into the ocean, and snorkel. Minuses: The uncoordinated may experience an up-close once-in-a-lifetime lava experience. Black Rock is great fun to jump from! Also known as Pu’u Keka’a. Black Rock was formed from one of the last-gasp lava flows on this side of the island. It is a rocky outcrop at the far North end of Ka’anapali Beach and blocks off access (from the beach) to the lesser-known Ka’anapali Resort beach called Kahekili Beach Park. The Hawai’ian name for Black Rock is Pu’u Keka’a, and ancient Hawaiians believed that this was the place where their spirits went to jump off to join ancestors forever. Unlucky souls who could not be shown the way by their family ‘aumakua (guardian animal spirit), would wander and attach themselves to rocks in the area. This is likely where the “it is bad luck to take a Hawai’ian lava rock” superstition comes from. Snorkeling and diving are also excellent all around this point. Weaker swimmers should beware that the water becomes deep quickly, and strong currents can occur in this location. See the Ka’anapali Beach page for more information about the beach. Location: At the far north end of Ka’anapali Beach. Facilities: Resort owned beach showers and most shop bathrooms are publicly accessible. We are staying at the Sheraton right in front of Black Rock Beach for our honeymoon at the end of September. This will be a first visiting Maui for both my fiancé and myself. Sooo with that being said we have spent the last few weeks booking excursions and researching the island so that we can experience the best things Maui has to offer while we’re there. As far as snorkeling goes, is there gear near by to rent for this beach? We plan to are do a snorkeling tour through Pride of Maui, I believe it’s called. Is it worth doing the snorkeling charter or can you get just as good snorkeling experience at this beach or any others?? Our other 2 excursions are zip lining through skyline tours in Kannapali and the sunrise tour through the same company of Haleakalā National Park. We also still plan to do the Hana Hwy but we noticed the pools are closed so we are wondering if it’s still worth a whole day of our time?? That all sounds like a blast! If you are nature and hike people, I would *definitely* still go on the Road to Hana, leave as early as possible and stop often to hike in to the different pools. You can look on this site for some key places to stop, Road to Hana is very strongly represented here 🙂 You may not want to stop at Oheo since the pools are closed – the Pipiwai trail hike there is wonderful though – give yourself 2-3 hours for that if you do it. Have a blast! Chealsea…You can rent snorkleing gear from the kiosk there by the pool at the Sheraton, however we rent ours from Maui Dive for the duration of our trip. Very reasonable. Snorkeling near Black Rock is pretty good. I prefer further north in front of the Westin Villas (you can take the free shuttle up there) for something nearby. Youre bound to encounter a turtle or two either place I hear great things about snorkeling near Molokini. There are also catamaran trips up to Honolua Bay. I took my first surfing lesson on my first trip to Maui. Totally fun. Teralani offers a great catamaran sunset sail up the channel with cocktails and apps. You can set that up thru the Sheraton. Might I also recommend learning to SUP (stand up paddle board). Ask a rep at the poolside kiosk and they’ll point you in the right direction for hourly rentals. Or there is a local you can rent boards from and I hear he will deliver the boards from you and pick them up (cant remember the name but you’ll find searching thru your browser). Consider taking the highway up north to Nakalele blowhole. Do NOT go near the blowhole, dangerous, but stand from a distance and enjoy. The zipline tour you’re taking is great fun! When you go to Haleakala for sunrise, check out the upcountry area. Surfing Goat Dairy, Alii lavender farm, make a day of it. Aloha! This place got my family hooked on snorkeling while in Maui. Beautiful fish and the occasional turtle and reef shark make this a must if you are staying near Ka’anapali. Less crowded than a snorkeling trip on a double decker charter boat although still crowded nonetheless because of its easy access and beginner-friendly waters. Best in the morning to beat the crowds but anytime works if you don’t mind extra people. Omg…the best snorkeling! Swam with 3 sea turtles & the fish were beautiful…one in particular was turquoise & orange. A must to experience! This area is called Pu’u Keka’a aka Black Rock. Snorkeling is great all along the rocks. There are warning signs along the rocks from the shore warning people not to climb up the rocks because of loose rocks and risk of injury. Snorkeling is not for the weak hearted and going around Pu’u Keka’a can get tiresome. To swim around Pu’u Keka’a toward the backside is possible but my suggestion is to be prepared to have to swim hard. There is a slight current that pulls you out to sea. Reminder touching Turtles are illegal in Hawai’i to refrain from that. You could be fined up to $5,000 and have to show up in court here in Hawai’i. Also the reefs and coral are very delicate so please wear environmentally friendly sunscreen that does not contain oxybenzone or be smarter and wear a rashguard. Happy Snorkeling! Not the best spot for snorkeling, crowded and a little difficult to get to.